What is the most efficient play in football? What is the analogue of basketball’s corner 3 point shot? This question bothered Robert Mays of Grantland, so he enlisted the help of the quants at ESPN. They found ample evidence that the play action pass is the most efficient play. To show this, they looked at expected points. Given a down, distance to a first down and field position, expected points is the average net points of the next score. From 1st and 10 from their own 20, the offense might score a touchdown for +7 points. The offense might also punt, which leads an opponent field goal and -3 points. Expected points averages these outcomes to assign each situation a point value. Expected points added (EPA) is the change in expected points on a given play. This statistic acknowledges that 2 yards on 3rd and 1 is worth more than 2 yards on 1st and 10. Mays and the ESPN quants found that the play action pass earned the highest EPA of all plays. And it wasn’t even close. Running plays lost expected points on average (-0.04 EPA), while passes averaged +0.04 EPA. The play action gained +0.17 on average, 4 times more than the typical pass. Deception matters in football. On a play action pass, the offense fakes a run, which freezes the linebackers. This frees up space down the field for a big pass play. In college football, I’ve also found that offenses that run the ball well like Auburn in 2013 can throw effectively on 1st and 10. The defense presumably expects a run, which makes it easier to throw for a big gain. Moreover, the data suggests that an NFL team doesn’t need a good run game to be effective with play action. For example, Minnesota had a strong rush attack with Adrian Peterson. However, the Vikings were only 21st in play action EPA over the last 4 years. Play action passes are pass plays, and a team needs a good quarterback to make those throws. The top teams in play action efficiency have quarterbacks like Aaron Rodgers and Peyton Manning. 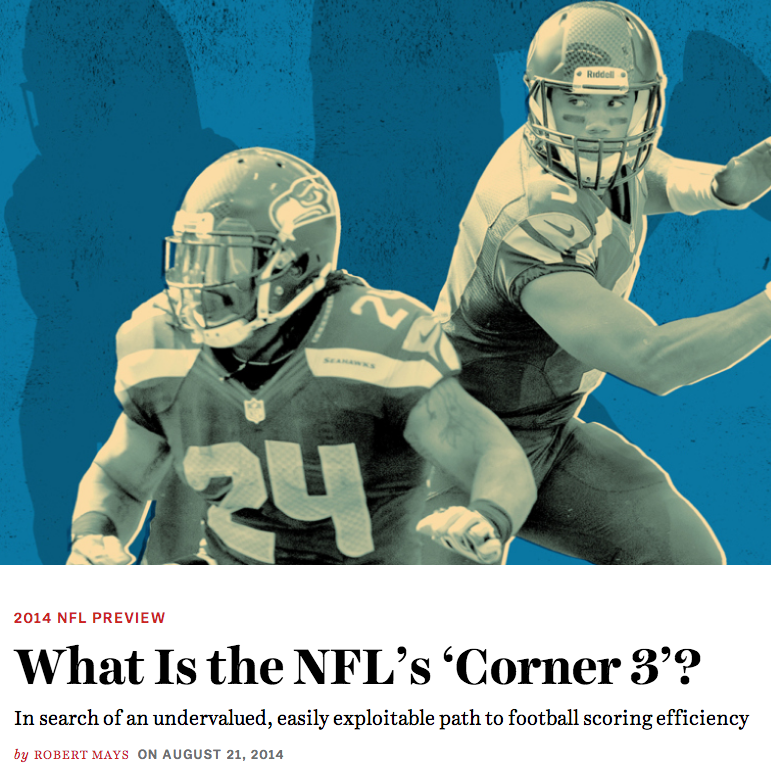 To check the article by Mays on football’s corner 3, click here. Do you want to get up to speed on football analytics? 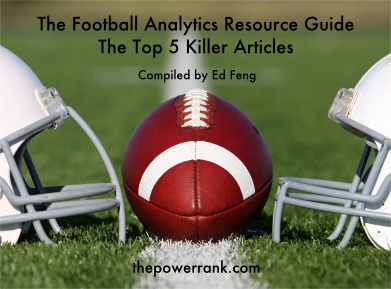 I’ve compiled 5 of my favorite articles in this free report.